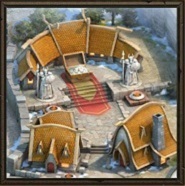 The following buildings can be constructed and upgraded in the Clan Stronghold. 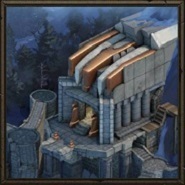 Here you can view the Stronghold summary and statistics. 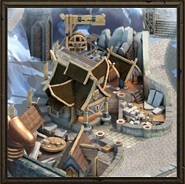 Upgrading the House allows you to construct other buildings and upgrade their level. 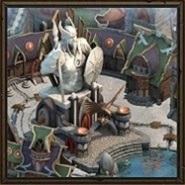 As the House of Jarls is upgraded, the Valley of the Aesir area is also increased along with the bonuses' amount and value. 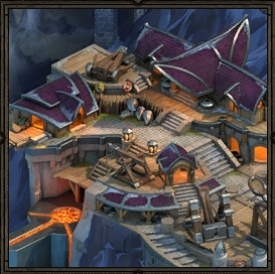 The Shamans' Residence allows you to learn Knowledge that increase the Stronghold’s vitals. Upgrading the Residence level provides access to new Knowledge and speeds up the learning process. 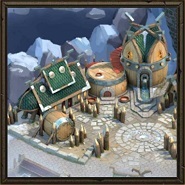 The Resource Storage is necessary for storing resources and Scrolls given by the Clan members as well as the unique resources produced in the Yards. 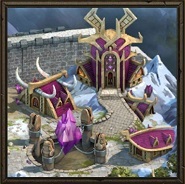 Upgrading this building allows Jarls to transfer more resources for contributions simultaneously. 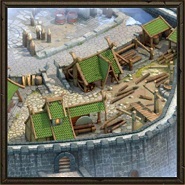 Yards are necessary for transforming common resources into the unique ones: Food into Ale, Lumber into Timber, Iron into Steel, Stone into Plates and Silver into Thoriars respectively. 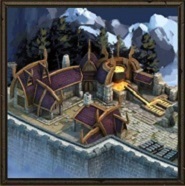 The Arms Guild is a building in the Stronghold where Drafts of battle attire are studied. 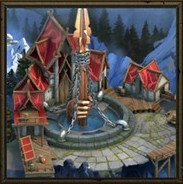 Drafts allow each member of the Clan to craft special equipment for their Hero in their Town's Forge.